Trip to Mysore was a very quickly decided. We have relatives there but have never visited them and so my wife P and I decide to go see them. On Feb27th, we took a bus to the Royal city and by afternoon we were there; first stop was near Harsha Bar, Bogadi. My cousin had warned me to wait there until she came and not enter the bar. :-) A few minutes’ walk and we reach her house, have good lunch and chat with her extremely creative son who has built a Yo Yo out of Vaseline tin, ear-phones out of waste speakers and a recycled drum out of waste plastic cans and taps. I browsed through his stamp collection, added one to it from my pocket and played videogame, cricket and throw-ball with the boy. My Cousin’s husband dropped us to P’s aunts’ house in Hebbal. P’s uncle is a wonderful man and is always full of stories and I enjoy his company the most. He returned from Bangalore at around 10pm after which we had dinner together and discussed lot of things which I hardly remember now, perhaps it was those kind of talks that are spoken and get evaporated rather quickly into the flowing air and does not seep into the flesh and blood; perhaps that’s what they call light talks. 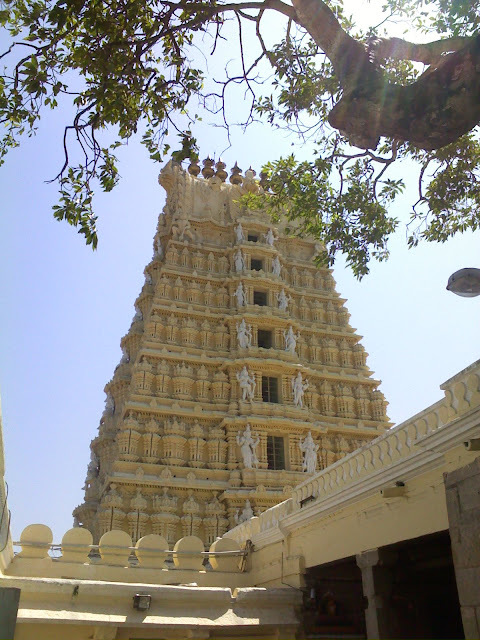 Next morning after a delicious breakfast (loooots of idlis) we drove to Chamundi hills. A 100 Rupee ticket got us into the main shrine in no time, another 10 Rupee to security guard got us even closer and another 10 Rupee to the priest got us the Prasada. :-) I wonder what things will turn out to be in future? 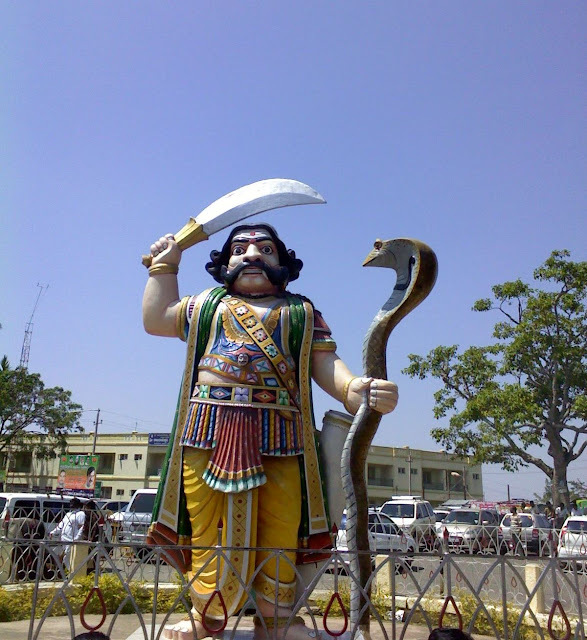 I come from a place (South Canara) were no such privileges are allowed, (at least so far) however crowded the temple is. I hope these practices do not spread but to look at it with another perspective it did help my old uncle and aunt who otherwise had to stand hours together in a queue. We stopped at Nandi were I bought a nice Ganesha idol made of Panchaloha to add to my Ganesha collection. Uncle dropped us at the railway station around, 5pm and we found the train so crowded that we decided to take a bus, so we rush to the bus stand and drive back home in a comfortable but expensive bus than a much less expensive but terribly crowded train. i have been there such a long time ago I can hardly remember anything. Superb! 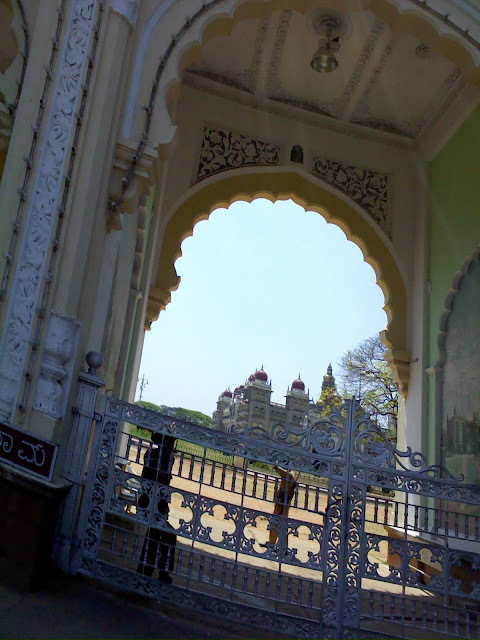 Mysore has always fascinated me and though a stones throw away, I haven't been able to do much! Next time, U shud travel to Ooty! 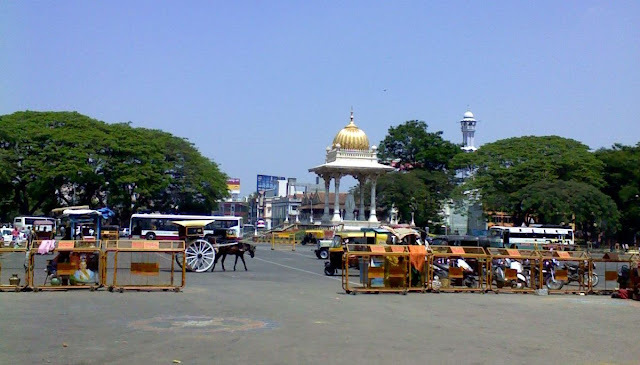 Mridula - You must visit Mysore during Dasara. Rakesh - There were plans to go to Ooty this time when we visit Coimbatore, but dont have that much of time i guess. Kish - :-) Well... she doesnt. Sounds like a nice light travel u took. It's interesting that it is possible to shorten/bypass the lineup by giving some gratitude to the security guards in the temple :D BTW. What's Prasada? Did wiki and saw that it is foods to be offered towards the gods? Edmund - Yes, in few places. Well Prasada, means food/flowers offered to God which are then distributed to the devotees as it is considered sacred.